A few years ago, a good friend gave Joe a running shirt with the saying on the front: “Joe lives for running”. While that may be stretching it a bit, there is no question Joe loves running! 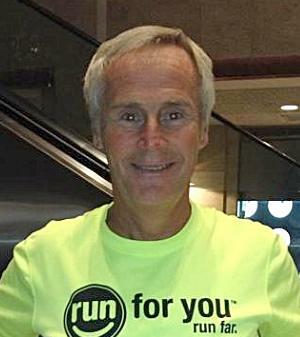 He loves running itself, talking about running, and most of all helping others catch the passion for running – that passion that provided him with so many benefits over the past 36 years. His adult running career started innocently enough with a United Way Corporate Cup 5K here in Charlotte in 1982. Like many beginner runners, that first 5K was hard and was not the best of runs. Yet, the spirit, camaraderie, and competition of that race triggered a passion that would drive Joe to cover over 200,000 logged miles of training and racing since that first 5K. He has raced just about ever distance from 5Ks to marathons to ultramarathons (50Ks, 50 mile, 100 mile, 24 hour, and multiday races). The longer the distance, the better! Yes, Joe loves running. 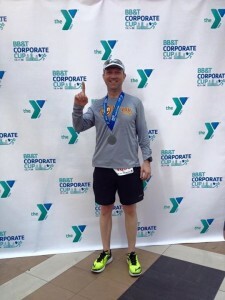 To date, Joe has completed 174 marathons (PR of 2:40:15) and 173 ultramarathons (distances over the marathon). His running of the 2013 Umstead 100 mile race was his 45th 100 mile finish. Joe really enjoys running on both the road and the trails. His favorite trail race is the Western States 100 which he finished 12 times, 6 of which were top 10 finishes. His favorite road race is the Boston Marathon and 2018 was his 18th Boston Marathon. Joe is one of the few runners who have survived Badwater, a 146 mile race from Badwater in Death Valley, CA (lowest point in the continental US) to the top of Mt. Whitney, CA (the highest point in the continental US). But his passion for running doesn’t end with his personal running. Over the years, Joe has informally coached many runners. Ten years ago, Joe was asked to coach distance running at Piper Glen, an opportunity that was just what he was looking for. 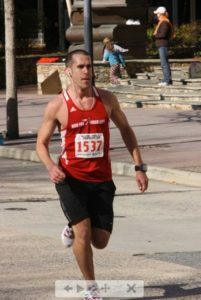 Joe is an RRCA (Road Runners Club of America) Certified Distance Running Coach. 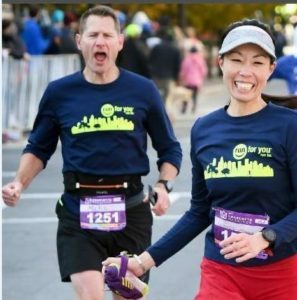 The joy of seeing runners achieve their running dreams is what now keeps Joe’s passion for running alive and burning. 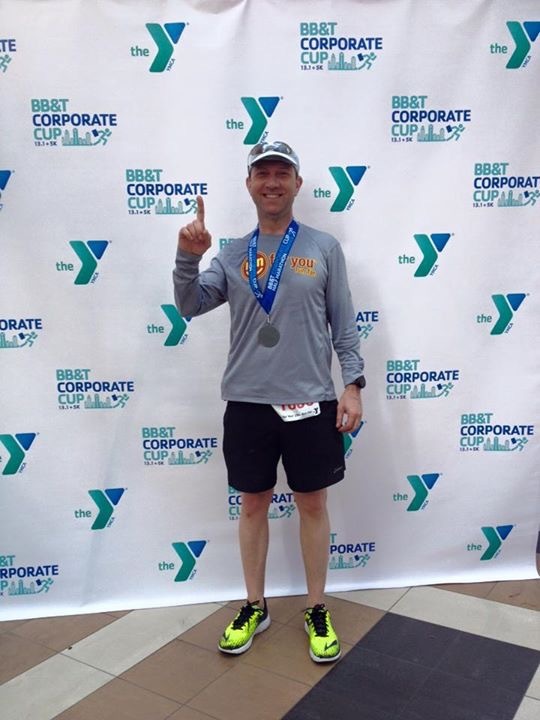 This year, Joe is a driving force behind the Run For You running programs. He certainly knows how to Run Far (and some would say Fast), but more importantly to pass on that knowledge and passion to others. Joe loves running…just ask him! My family and I moved to Charlotte from Syracuse, NY in July of 2010. Although I was not a “runner” then, I was enticed by the “Real Life Forrest Gump” aka Joe Schlereth to join the best running group in the south – Run For You, Piper Glen. My goal was to be able to run through the Disney parks, “just once” (I normally skip through.) 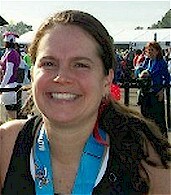 I signed up for my goal race – the Disney Half Marathon to be run in January, 2011. Somehow, I ended up running a full marathon prior to that signature race. It may have something to do with the power of the group, the magic of the speed demons of Piper Glen, or the family of cheerleaders I have for support. That was over six years ago. Since that time, I have run 12 full marathons and 24 half marathons. I am so excited to coach again this year and share my passion with others. I am hoping you will find “Run for You” to be not only the best way to train for a marathon, but the only way!!! 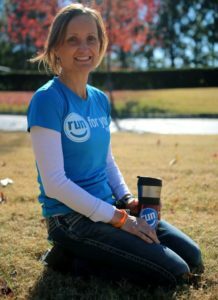 My friend, Tara Daley told me about RFYL training programs in 2013 and I thought anyone that ran 18 miles at one time was crazy. Not much has changed about that opinion since 2013, but now I run those long miles with her. I moved to Pineville in 2014 and since RFYL was right down the road and we start in the early morning I could get my workouts in before work. I haven’t always been a runner. Running is something I’ve had to work at. The best thing about RFYL training program is that I get to do the hard work with others. If my buddies can get through it, I know I can too. 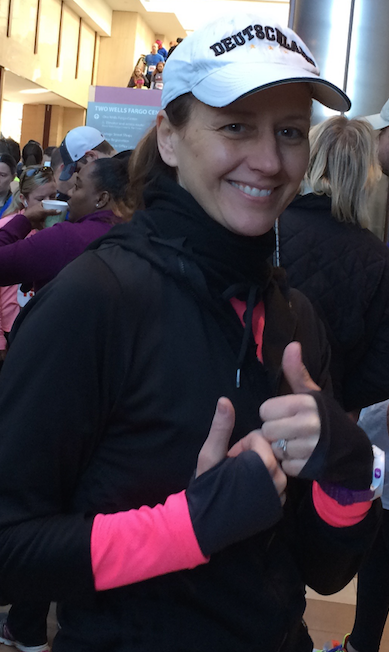 Kim started running in 2011 with the goal of running a 5k. She got bitten by the running bug and started training for a half marathon. One turned into 60+ over the years, and became her favorite distance to run. She has run 4 marathons, and will run Berlin this year. Kim runs in Disney at least once a year and ran her first 2 marathons there. She began sharing her love for running with girls as a Girls on the Run Coach and has been coaching there for 5 years. After she moved from NJ to SC in 2016, Kim found the PG Speed Demons through the recommendation of a friend and trained for the NYC Marathon with them, while getting her RRCA Coaching certification. She has mentored adult runners in the past and looks forward to coaching, so she can share her addiction with others! “For me, running is part of who I am. It is a way of life,” she says. Since joining the group Melissa also advanced her education to become a Certified Health Educator and Nutritional Consultant, with a specialization in (you guessed it) sports nutrition. In addition, last spring she completed the RRCA (Road Runners Club of America) Level 1 coaching certification. 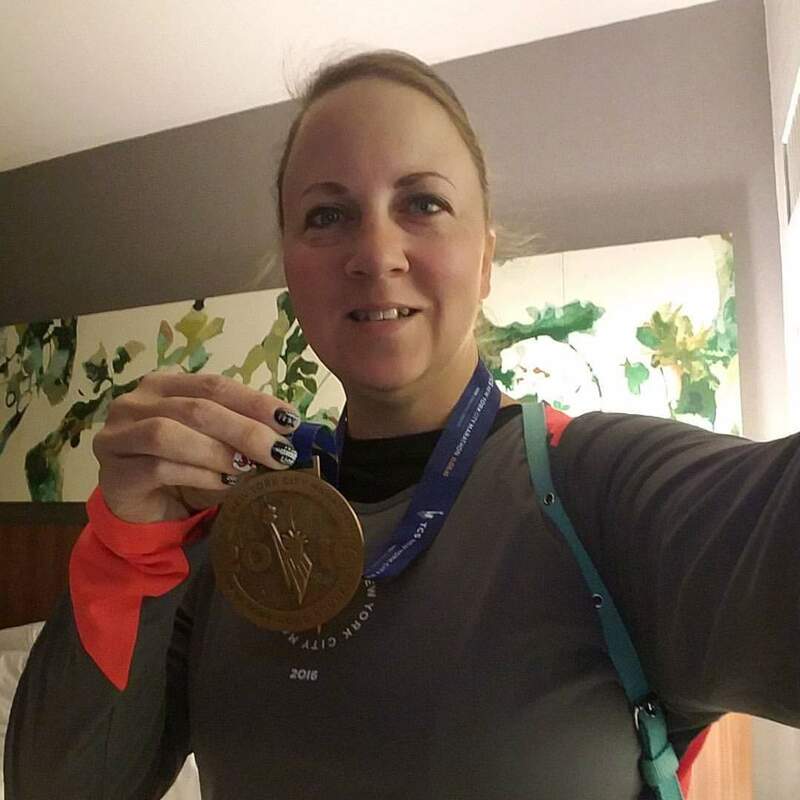 In 2015 I signed up to run my first marathon. I was turning 40, changing careers, recently divorced and raising two boys on my own. I felt like I was a bit lost and thought that the best way to find my direction was to put one foot in front of the other and move forward. My marathon training started that simply: putting one foot in front of the other. I wasn’t fast, I wasn’t fit, but I was focused. RELENTLESS FORWARD MOTION became my motto. My first marathon was Charlotte 2015, just a few days after my 40th birthday. I’ve heard it said that “Everything you ever wanted to know about yourself you can learn in 26.2 miles.” The person who starts the marathon is not the same person that finishes it. When I first signed up for Charlotte 2015 I thought it would be a cool thing to cross of my bucket list. It became so much more. I have run five marathons and countless other races since that first one. They all have taught me something different about who I am and this “race” that is my life. My favorite thing about running is that anyone can do it. It’s never too late to start. You are not too old to start. You can’t mess it up. You will have things that go wrong, but those are the things that teach you the most. The race may not be the race you envisioned, but as long as you show up, as long as you try, as long as you keep moving forward, you will never, ever be a failure. The only requirement to being a runner is just that: RELENTLESS FORWARD MOTION. My pace group is called the Battle Buddies! We put a lot of miles on the streets together, and sometimes you need a friend to pull you through them! 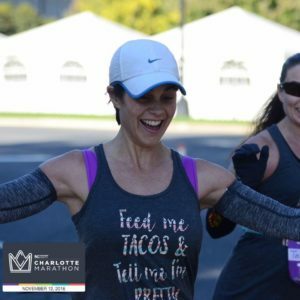 I started running seriously in 2011 with my first half marathon in Charlotte. 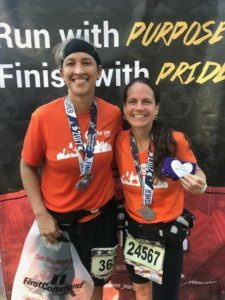 I joined the Speed Demons in 2014 – after joining this amazing group, and along with the training plan, speed work, and a few hill repeats, and lots of new friends, I cut 25 minutes off my time from my first and second marathons! Since then, I have now run almost 20 half marathons, 9 full marathons and marathon 10 will be in Chicago in 2019! 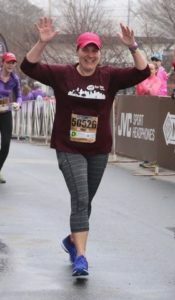 Also, I have Multiple Sclerosis (MS) and have used several of my races to raise money for the National Multiple Sclerosis Society; to date, I have raised over $18,000. I started running in 2004 to complete a 5K with my 8 year old daughter. I had never been much of an athlete and I started by running 30 seconds at a time. One of the greatest memories of my life was the feeling of completing my first full mile running. Fast forward to 2013, and I had been running on my own, losing weight and getting healthier, and doing a few races here and there, including a couple of half marathons. I saw a flyer on the Greenway for a running group at Run For Your Life and decided to check it out. I found my running family and haven’t looked back. That year, I completed my first marathon. Since joining the Speed Demons, I have made many new friends, improved my ability to set and meet running goals safely, and changed my life in countless ways. I gained the courage to learn to swim and complete a sprint triathlon. Run For You has helped me to make running an important part of my life. This season, I will be working on my third marathon. I am really looking forward to coaching this season and helping others to meet their running goals. If I had to choose one best thing about the Run For You program, it would be the empowerment that it has given me to reach my goals. It’s so easy to set goals, but much more difficult to reach them. With the support of my running friends, knowledge and education to set reasonable goals, and loads of accountability and encouragement from the group, I know I can achieve whatever I aspire to.